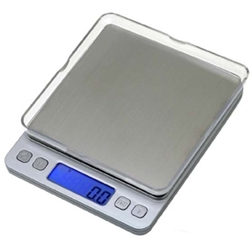 The "Wiz" digital pocket scale manufactured by US Balance features the largest weighing platform in its class. The Wiz features a bright blue backlight, silver casing, and two covers that double as weighing platforms/expansion trays - making the Wiz the most versatile unit we have. Ready to use out of the box this instrument is packed with handy features. The parts counting function (PCS) makes it possible to count large quantities of parts of the same weight. At 2000 grams the Wiz provides a maximum capacity scale at top value! - Overall Size: 5" X 4.25" X 0.9"